The suggested template can be used to acquire an online radio station and increase the customer segment and keep in touch with them 24/7. The website will never have the accessibility problems and viewers would always be able to listen to your channel and music. The website will be compatible with various browsers like Google Chrome, Opera, Internet Explorer, Firefox and etc. The template has a responsive design which means that viewers would be able to listen to your radio from any device like personal computers, laptops, tablets, mobile phones and etc. It is a very beneficial feature since nowadays we have a wide variety of devices and people are using them very frequently. Moreover, the design of the website will be altered depending on which gadget is used so the website will always look flawless leaving the viewers highly satisfied. The suggested WordPress Radio Station theme has a lot to offer, for instance, seven different pages that can be employed to compromise all the information in a very detailed way. The template also includes a blog page which can be used to publish some interesting articles related to your radio or music. The exciting and engaging blog will help you to increase the number of viewers, listeners and the traffic of your website. The theme also has a separate page for Gallery where can be uploaded the images of past and upcoming events, DJs, artists, bands and etc. If you like the images that are used in the template, feel free to use them since they are already included in the price package. The theme also has a separate page for contact information that can be used to publish the street address, e-mail address, telephone and etc. The contact page also compromises the Google Map tool that can be used to show the exact location of yours to the viewers. There is also included the working contact form that can be used to communicate with website viewers very easily and smoothly. Moreover, the template includes fantastic widgets, plugins and working slideshow, all of which will help you to have a highly functional website without any lags and problems. The theme price package also includes the free installation service if you are a customer of M9Host which is a web hosting company. 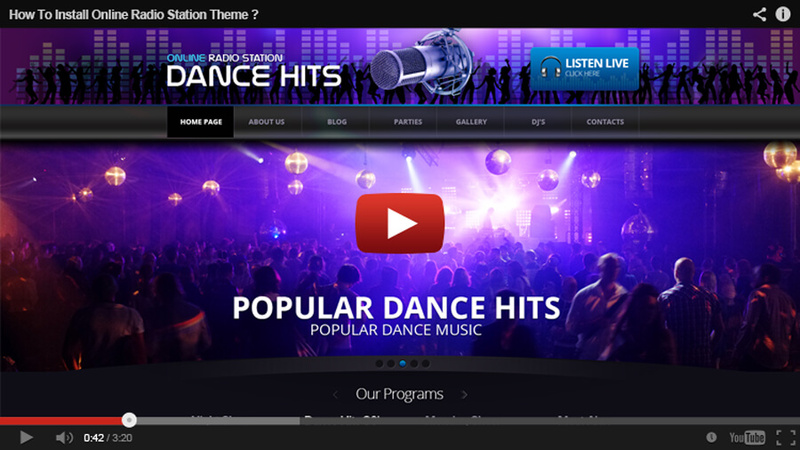 In the template description, you will also find the separate page with video tutorials that explain how to install online radio station theme and how to change the WordPress theme’s USERNAME and PASSWORD. However, if you still have some questions, do not hesitate to ask and leave them in the comment section and our support team will get back to them as soon as possible. To have the smooth explanatory processes, we will offer again video tutorials which will answer all the questions fully. 1. HOW TO INSTALL ONLINE RADIO STATION THEME ? 2. HOW TO CHANGE WORDPRESS THEME's USERNAME & PASSWORD ? Is this template compatibil with rss aggregator ? and does it have an icon for vk social network ?